all-natural oils. Add it to your bath, apply to wet skin after showering, or use it for a relaxing all-over body massage. 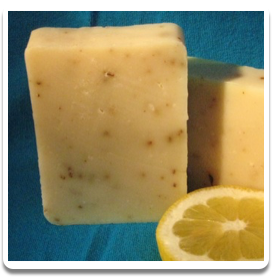 It's mild patchouli and lavender essential oil blend is light, and it's wonderful to use as a layer before lotions or perfumes...or enjoy it's own delicious fragrance. Many enjoy it instead of lotion or perfume. 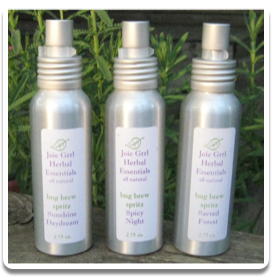 We’ve added both lavender and patchouli for their soothing and calming effects. 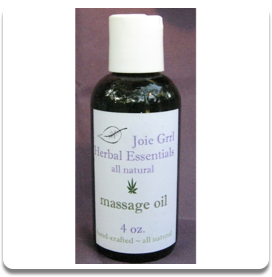 This mild essential oil blend is light and sensual, and very relaxing. 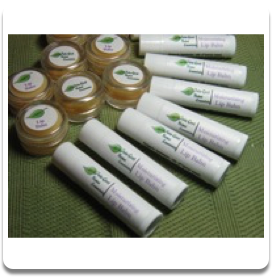 Our soothing lip balm is rapidly becoming our signature product! This special blend of organic beeswax, hemp seed oil, jojoba, and other natural oils and butters will sooth and soften your lips like nothing you've tried before. It glides on easily, and provides long-lasting protection. You won't want to go anywhere without it! With oil of peppermint. and is steamed distilled from the roots. It smells warm and earthy, peppery and spicy. As an added bonus, it’s a repellant to insects! Aromatherapists use patchouli to treat anxiety and depression. relieve effects of insect bites and help heal rough cracked skin. Many find it is excellent for controlling acne. 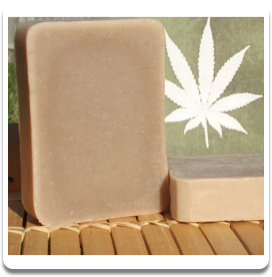 Hemp seed oil is pressed from the seeds of Cannabis sativa, and it is free of THC. These produce a rich, pure oil that is perfectly suited for skin care. No other oil from the plant kingdom is as rich in essential fatty acids (EFA) as hemp! Nag Champa is a fragrance from India. It has a high concentration of sandalwood. Nag Champa belongs to the "Champa" class of Indian incense, originating from the Champa flower. Champa incenses contain a natural ingredient indigenous to India called "halmaddi", which is a semi-liquid resin taken from the Ailanthus Malabarica tree. You may recognize the aroma of Nag Champa from concerts, shops selling Indian goods and many health food stores, as well as metaphysical and New Age book stores, music stores, and head shops. Many use Nag Champa to stimulate spirituality and meditation. Lemon can help to clear thoughts, & relieve headaches and migraines. It may also help soothe insect bites. Eucalyptus oil is traditionally used to inhibit proliferation of the cold virus, deter mosquitoes, cool emotions, and aid concentration. May help clear up sinus congestion. 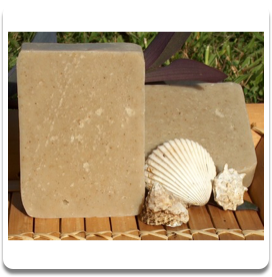 A great soap for gardeners, hikers, campers, and folks who enjoy the outdoors. Lavender calms and soothes the spirit, and it may help relieve insomnia. It is used to promote growth of new skin cells, and to aid healing of acne, burns and sunburn, eczema, psoriasis, fungal growths, and scarring. 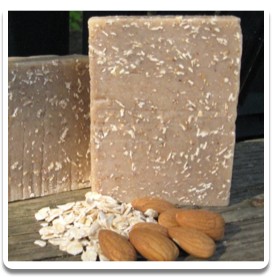 Ground oats have been used in beauty bars for centuries as a gentle exfoliant that stimulates circulation to maintain healthy, beautiful skin. Oatmeal soothes sensitive skin and exfoliates with a gentle touch, leaving skin soft and supple. 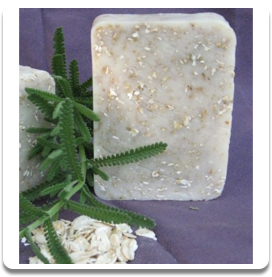 The gentle exfoliation and healing qualities of oats and lavender are blended to create a perfect marriage of two favorite soaps, oatmeal and lavender. Dead Sea mud stimulates blood circulation, rejuvenates skin, and deep cleans to remove impurities. The fine, natural grain of the mud softly, yet effectively, sloughs off dead skin cells and leaves the skin looking and feeling fresh and radiant. The Dead Sea Mud used in our soap is not a powder, it is certified mineral-rich Dead Sea mud from the Dead Sea, imported from Israel. This is an extra emollient bar. Sea Kelp, rich in vitamins and minerals, is believed to remove impurities, re-mineralize, restore elasticity to the skin, and leave the skin feeling soft and smooth. 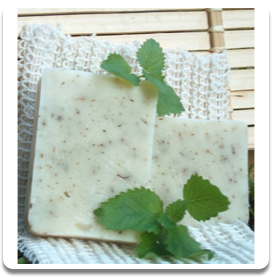 Cedarwood is a natural insect repellent, antiseptic, deodorant, and skin conditioner. Sage is often used for self-purification and dealing with grief and loss. It is often used to improve mental ability, bring wisdom, and promotes spiritual, mental, emotional & physical health and longevity. Sage removes negative energy. 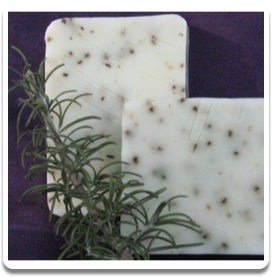 Rosemary essential oil smells clean and refreshing and has natural purifying antibacterial properties. Almond has long been treasured as a very effective emollient, and improves one’s complexion. It is beneficial for eczema, psoriasis and itchy, dry and inflamed skin. It is rich in essential fatty acids and vitamins A, B1, B2, B6 and E. Oatmeal soothes sensitive skin and exfoliates with a gentle touch, leaving skin soft and supple. The ground oatmeal provides a pleasant warm scent that blends delightfully with the almond aroma. Exfoliate, moisturize, stimulate and protect the skin in one step! 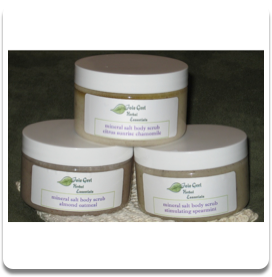 Our Dead Sea salt scrubs are an excellent way to keep your skin healthy & glowing. They are best used once or twice a week as part of your skin care routine. They slough off any dry or dead skin cells, keeping your pores clear, making it easier for the skin to breathe. Your skin will be left with a glow, thoroughly moisturized. All-Natural Bug Brew - in a 2.75 oz. brushed aluminum bottle. Each contains essential oils that we've researched will drive bugs away. They've worked well for us...some bugs may light on your skin, but fly away, not stinging or biting. There's vegetable glycerin in them, too, making them moisturizing...also helps the light spritz stay on your skin. There are no toxins or poisons in these...all natural ingredients that are safe for you and the environment. The bottles are beautiful and are a perfect size to stash in your pocket or backpack in the woods! (Keep one in a pocket of your stroller, too...they are all safe for kids!). 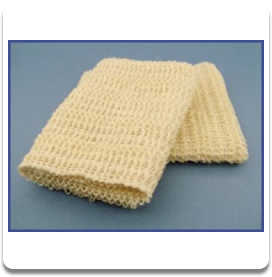 The agave washcloth is a wonderful, natural addition to your bathing routine! It is made of soft looped sisal fibers, one of nature's most versatile, from the agave cactus. 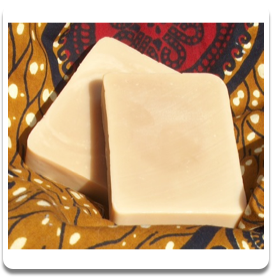 It lathers well with any of our soaps, with a large cleaning surface of 12.5" x 12.5", and is quick to dry. Your skin with love the renewed and refreshed feeling you get after using this cloth! Allow your hand-crafted soap to fully dry between uses with these beautiful natural wooden dishes. 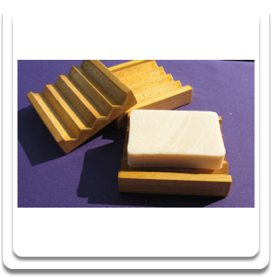 The angled cut ridges hold the soap away from water, prolonging the life of the bar. Nicely carved, solid one piece design. Excellent Quality. They are beautiful and functional!